This is an indicator for Quasimodo or Over and Under pattern. 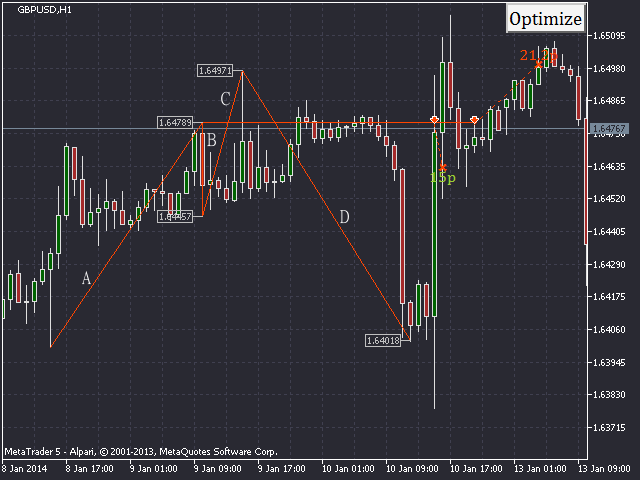 It automatically finds the swing points and can even place virtual trades with stop loss and take profit. It can also find the most profitable settings. The pattern consists of four legs A,B,C,D as shown in the pictures. Its parameters are explained below. Buffer - Pips distance from SR (support or resistance) line where a trade is triggered. StopLoss - Stop loss in pips. SwingTakeProfit - The take profit level is at a recent swing point. Set to 1 for the end of leg B swing point or to 2 for the end of leg D swing point. 0 disables this option. If TakeProfit value is greater than zero then it is added to SwingTakeProfit level. Spread is added for shorts. SwingStopLoss - The stop loss level is at the highest/lowest swing point. Spread is added for shorts. MaxTradesPerPattern - The number of times that SR is touched and a trade is triggered for each pattern. The pattern is valid until the maximum number of trades are opened. LongTrades - Long virtual trades are allowed. ShortTrades - Short virtual trades are allowed. ProfitableTradesPercentage - The minimum allowed percentage of profitable trades during optimization. OptimizeBuffer - Minimum and maximum buffer values used for optimization. The values should be seperated by a "-" symbol. OptimizeTakeProfit - Minimum and maximum TakeProfit values used for optimization. The values should be seperated by a "-" symbol. 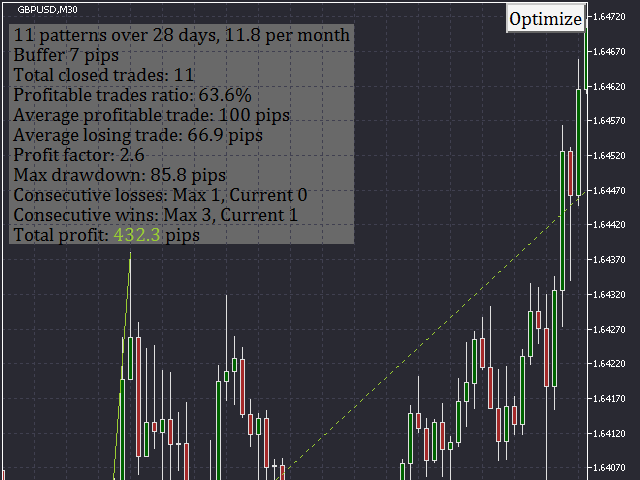 OptimizeStopLoss - Minimum and maximum StopLoss values used for optimization. The values should be seperated by a "-" symbol. UniqueID - When optimization is finished, a file with optimized settings is automatically saved in "Files" folder. UniqueID is the name of this file and should be different for each indicator instance. Load this file to preserve optimized settings. Alerts - An alert pops up. All the alerts options consist of two digits. 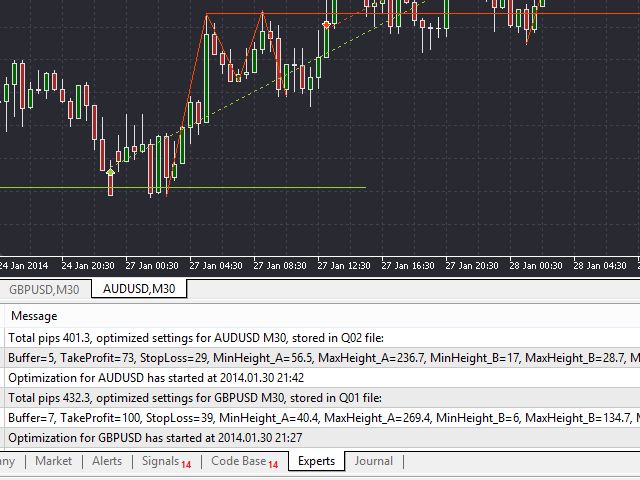 For the first one 0 disables alerts, 1 alerts when a trade is opened, 2 when a trade is closed, 3 in both cases. For the second digit 0 disables alerts, 1 alerts when a pattern is formed. AlertSound - Sound of the alert, a custom sound placed in the "Sounds" folder can be used. Email - Sends an email. Notifications - Sends a push notification to a mobile phone. ScreenShots - Takes a screenshot and saves it to the "Files" folder. OnlyOnePattern - Only one pattern can be valid, a long and a short patterns can't be simultaneously valid. CancelPatternCandles - Maximum number of candles a pattern can last. The count starts from the end of leg D.
MinHeight_A - Leg A should be at least this height in pips. The same applies to the rest legs. MaxHeight_A - Leg A should not exceed this height in pips. 0 disables this option. The same applies to the rest legs. MinCandles_A - Leg A should be at least this number of candles. The same applies to the rest legs. MaxCandles_A - Leg A should not exceed this number of candles. 0 disables this option. The same applies to the rest legs. PastBars - The number of past bars used by the indicator.